Published by Louisa May Alcott in 1868, Little Women chronicled the coming of age of Meg (Melanie Stone), Jo (Sarah Davenport), Beth (Allie Jennings) and Amy March (Taylor Murphy), siblings being raised by their mom (Lea Thompson) in Concord, Massachusetts while their absentee father (Bart Johnson) served as a pastor during the Civil War. The semi-autobiographical novel's main characters were ostensibly based on the author and her three sisters. The iconoclastic opus challenged the status quo by exploring such themes as love, independence and equal rights from a female perspective, challenging the conventional thinking about domesticity and other traditional women's roles. The seminal work's title was inspired by its teenage heroines' loss of innocence on the road to adulthood. 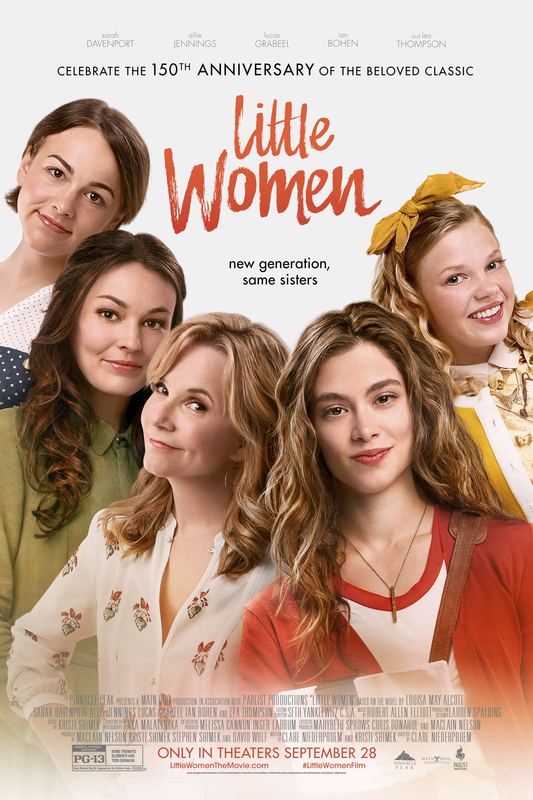 Over the years, Little Women has been brought to the big screen a half-dozen times, most notably the productions featuring Katherine Hepburn (1933), Elizabeth Taylor (1949) and Susan Sarandon (1994). And Greta Gerwig (Lady Bird) has already signed to direct another adaptation co-starring Emma Watson, Saoirse Ronan and Meryl Streep slated to be released in December of 2019. This year's version, with a relatively-underwhelming cast, marks the directorial debut of Clare Niederpruem. What does make the movie unique, however, is that it is set in present-day New York. Unfortunately, the film fails to explore current feminist issues, and the result is an unengaging story which feels terribly dated instead of groundbreaking. A disappointing, 21st Century update that's behind instead of ahead of the times.